Because my son has so many food allergies, we are always on the search to find products that he can have. One of the brands we depend on, and are so thankful have added to our diet is Ancient Harvest Quinoa. Second, my son who has to stay away from so many, Ancient Harvest Quinoa products are a blessing because they are gluten and wheat free. Third, they are good for you! Even if you don't have to carry a gluten free or allergy friendly diet, you really could benefit from the addition of quinoa to your diet. Non GMO, organic, and gluten free. The ingredients couldn't get any simpler, "organic corn flour, and organic quinoa flour." On the box you can find facts about quinoa, it states "Quinoa stands alone as a complete protein grain. It supplies all the essential amino acids in a balanced pattern." followed by a nutritional analysis of quinoa compared with other grains, and an amino acid breakdown of quinoa. My son who cannot have wheat, rye, oat, gluten, millet, and buckwheat CAN enjoy these great pasta products that are as good as the "regular" pastas. I was able to create different variety of dishes for my son recently. I made him the "Linguini" pasta with mixed veggies and the "Linguini" with "Chicken Parmesan," and the "Veggie Curls" as a cold salad from Ancient Harvest Quinoa. I also made him the "Elbows" pasta with some veggies for dinner one night. All he asks for is noodles now. We barely ever go out to eat, but these past two weeks, we've had many dinner invites, and were able to enjoy it, because I was able to make the dishes for him that was easy to make, take to go, and of course something he loved. 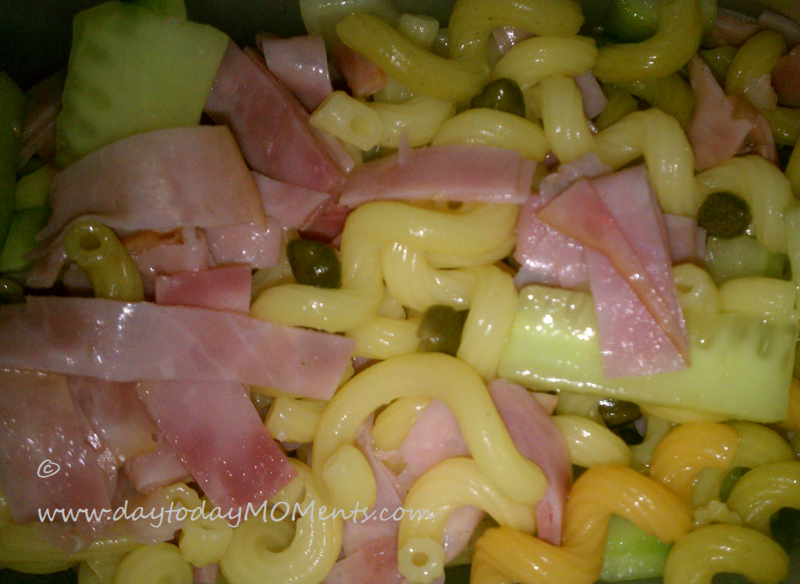 The salad I tossed together for my boy with the "Veggie Curls" pasta, that he loved. Colorful veggie curls. Ingredients: organic corn flour, organic quinoa flour, dried organic red bell peppers and dried organic Spinach. The pasta dinner made with the "Linguini" pasta. 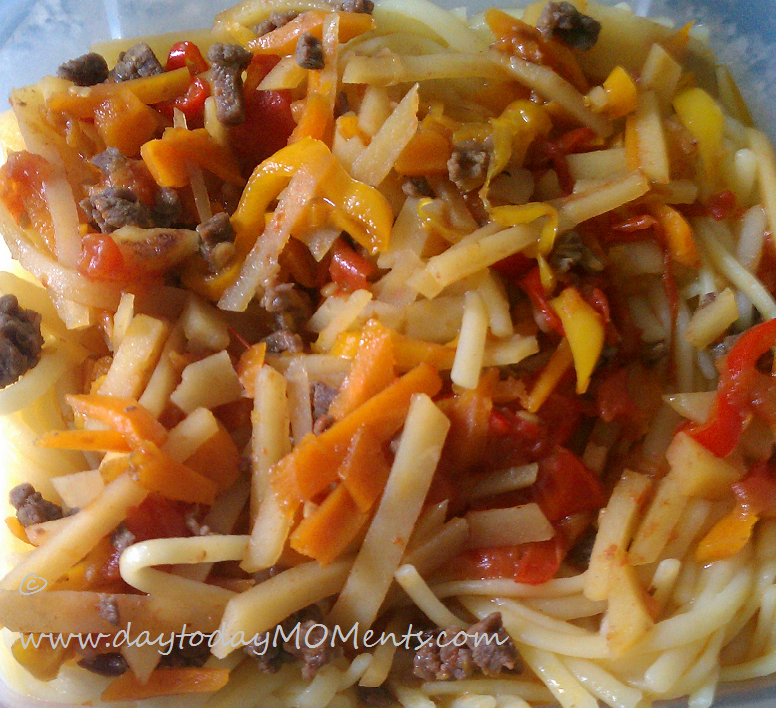 The "Elbows" pasta with veggies. Meatballs..Linguini..and chicken "parmesan." Taken by camera phone. *I received these items to review, but all opinions are a 100% my own.